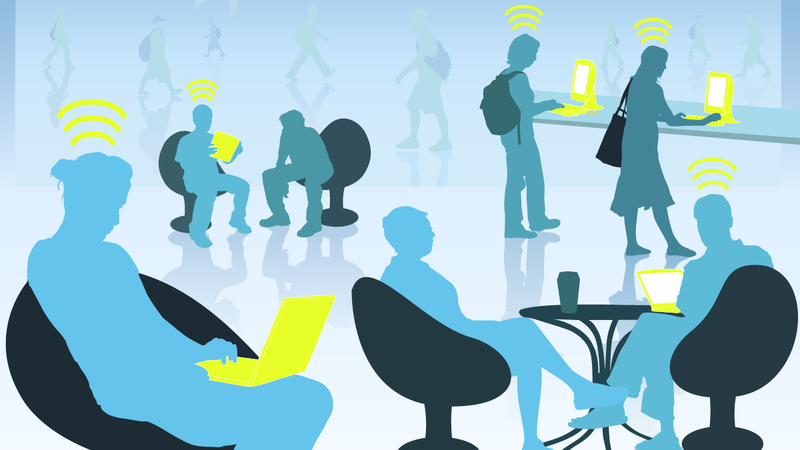 The upside of WiFi is that it's everywhere-- invisibly connecting laptops to printers, allowing smartphones to make calls or stream movies without cell service, and letting online games battle it out. The downside is that using Wi-Fi consumes a significant amount of energy, draining the batteries on all those connected devices. Now, a team of University of Washington computer scientists and electrical engineers has demonstrated that it's possible to generate Wi-Fi transmissions using 10,000 times less power than conventional methods. The new Passive Wi-Fi system also consumes 1,000 times less power than existing energy-efficient wireless communication platforms, such as Bluetooth Low Energy and Zigbee. A paper describing those results will be presented in March at the 13th USENIX Symposium on Networked Systems Design and Implementation. The technology has also been named one of the 10 breakthrough technologies of 2016 by MIT Technology Review. "We wanted to see if we could achieve Wi-Fi transmissions using almost no power at all," said co-author Shyam Gollakota, a UW assistant professor of computer science and engineering. "That's basically what Passive Wi-Fi delivers. We can get Wi-Fi for 10,000 times less power than the best thing that's out there." Aside from saving battery life on today's devices, wireless communication that uses almost no power will help enable an "Internet of Things" reality where household devices and wearable sensors can communicate using Wi-Fi without worrying about power. To achieve such low-power Wi-Fi transmissions, the team essentially decoupled the digital and analog operations involved in radio transmissions. In the last 20 years, the digital side of that equation has become extremely energy efficient, but the analog components still consume a lot of power. The Passive Wi-Fi architecture assigns the analog, power-intensive functions -- like producing a signal at a specific frequency -- to a single device in the network that is plugged into the wall. An array of sensors produces Wi-Fi packets of information using very little power by simply reflecting and absorbing that signal using a digital switch. In real-world conditions on the UW campus, the team found the passive Wi-Fi sensors and a smartphone can communicate even at distances of 100 feet between them. "All the networking, heavy-lifting and power-consuming pieces are done by the one plugged-in device," said co-author Vamsi Talla, an electrical engineering doctoral student. "The passive devices are only reflecting to generate the Wi-Fi packets, which is a really energy-efficient way to communicate." "Our sensors can talk to any router, smartphone, tablet or other electronic device with a Wi-Fi chipset," said co-author and electrical engineering doctoral student Bryce Kellogg. "The cool thing is that all these devices can decode the Wi-Fi packets we created using reflections so you don't need specialized equipment." The technology could enable entirely new types of communication that haven't been possible because energy demands have outstripped available power supplies. It could also simplify our data-intensive worlds. "Even though so many homes already have Wi-Fi, it hasn't been the best choice for that," said co-author Joshua Smith, UW associate professor of computer science and engineering and of electrical engineering. "Now that we can achieve Wi-Fi for tens of microwatts of power and can do much better than both Bluetooth and ZigBee, you could now imagine using Wi-Fi for everything."